Throughout my career, I have squeezed in several landscapes of lilacs—a flower that signals springtime in my home state of Minnesota, and the kind that line a block and whose lingering scent wafts through open windows. In 2004, closely monitoring the timing, Mother Nature’s Memorial weekend rain washed that out, which is how the whole floral series came to life. 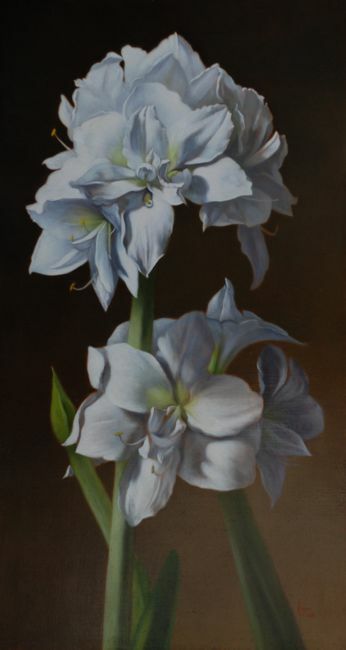 Unlike my still life paintings, which don’t include “living” things, the floral series portray a freshness and “lightness” that sets these pieces aside from my Vanitas pieces—compositions that tend to leave people with an uneasy feeling because they include things like skulls, dead flowers, mirrors, etc. Meandering the garden path, following the footsteps of the Masters, the paintbrushes mix with pigments that nearly brings to life a single magenta gladiola, a vaseful of lilacs the color of raspberry sherbet, or the splendor of a softball-size white peony, where the petals are seen in a whole new light.